The Iwate-Miyagi Nairiku earthquake in 2008 (M7.2) caused the Aratozawa landslide which have a huge earthquake landslide exceeding 900 m in width, 1,300 m in length and 100 m in depth. Although the average slope of the main sliding surface of this landslide was remarkably gentle (about 2°), the landslide body moved about 350 m. In addition, although the moving distance was large, the main landslide body reportedly experienced minimal damage except at the edges. The Higashi Takezawa landslide caused by the Chuetsu earthquake in 2004 (M6.8) is a similar example. In that case, although the landslide body moved about 100 m, the main moving body retained its original form for most of its part (Nakamura 2009). In this study, we researched why the erarthquake landslides move long distances despite the gentleness of the slope and why the sliding bodies caused by the earthquake landslides minimally damaged although the moving distances were large. 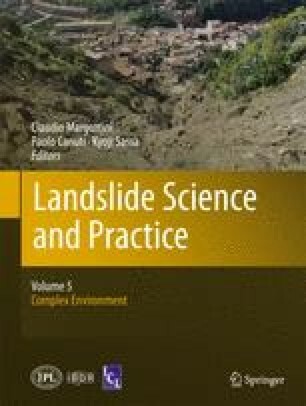 The research was conducted by the transdusing law of conservation of energy and the modeling by using actual mesured values of the Aratozawa earthquake landslide. We concluded that the ground water temperature near slip surface of the earthquake landslide exceeds the vaporization temperature by frictional heat of moving masses and it make the water vapor. The water and vapor near slip surface behave as shock absorber to downward pressure and the sliding energy of moving masses. As a result, landslide movement becomes easy, which can reduce the damage of the moving body. We named this phenomena “Vapor lock phenomena in earthquake landslides”. First of all, I would like to thank Ms Mika YAMAO for the support to writing this article.